Two huge bulls casually fed at the upper edge of the steeply sloping clearing, but I cautioned my excited clients that we were not going to get a shot in the fast failing last light of day. I’d seen the same two bulls, along with a 180-class mule deer buck, in that same clearing the past two mornings and evenings, and figured it would be a slam dunk to get into shooting position across the canyon. The problem was that the clearing was about 11,500 feet above sea level, and the hike from the Forest Service roadway to the clearing was almost 2,500 feet straight up. From past forays in the area, I figured we were faced with a minimum four hours of strenuous climbing. When they nodded enthusiastically, I further explained that we would have to climb most of the morning, work into shooting position, and then wait for the elk to make a reappearance in the afternoon or evening. If we downed one or both of the bulls, depending on how early they showed up, we’d probably have to spend the night on the mountain and pack the critters down to the road the next day. Both men declined to commit to that kind of effort, regardless of how big I thought the bulls might be. That was the last season I guided elk hunters. I was working mostly public land, and the elk had been changing their habits and getting tougher to hunt. It also seemed like my clients were getting softer and coming less prepared to do what it took to be successful. The elk is one of the biggest, toughest, and most adaptable big game animals roaming North America. When they hold in the high country, they present one of the most challenging hunts. According to the historical record, when Europeans first crossed the Mississippi, the wily wapiti dwelled in the foothills and high prairies. But with the first firearm hunting pressure from early trappers, mountain men and settlers, they lit out for the high country, and they haven’t stopped adapting to this day. In fact, today’s elk isn’t the same critter I started out hunting in the mountains of Colorado 40 years ago. The methods I used then to successfully spot, stalk and call elk wouldn’t put much meat on the table today, let alone horns on a trophy room wall. 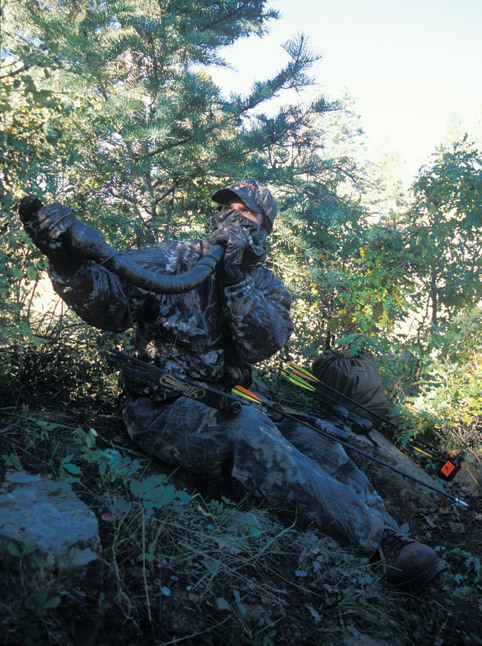 Preseason scouting, and the hunting that follows, is much more a game of patience, persistence and hunting smarts. Elk throughout their range have been educated by an increase in hunting pressure from both two-legged and four-legged predators. This constant pressure is pushing the elk into the most remote and inaccessible areas. The exceptions occur on private land where access by hunters is carefully limited and controlled. And even in some of these areas, especially in the northern tier of Western states, marauding wolves now keep the elk in a constant state of high alert. Wolf predation in some areas has reduced elk populations to the point they may no longer be sustainable let alone huntable. I know outfitters and guides in Wyoming, Montana and Idaho who have simply given up because of the drastic reduction in elk numbers. Today, about the only way to get up close and personal with a trophy bull elk on public land is to pack into the most remote and rugged areas imaginable. I tell inquiring hunters to picture the area they would least like to venture into to hunt and, heaven forbid, pack out an elk. That’s where they’re most likely to find a trophy bull elk. A hunter whose idea of scouting elk is to cruise the back roads in his truck or take a leisurely hike through an intended hunting area, bugling and cow calling, is apt to be sorely disappointed come opening day of hunting season. Most of my preseason scouting is done behind powerful binoculars and spotting scopes, from long distance where I encroach as little as possible on the actual hunting areas. In dense timber and heavy cover, I may hike in to study the sign at rubs, wallows, water holes and trails. But I strive to be as invisible as possible, using scent suppression sprays and always keeping the wind in my favor around likely elk feeding, bedding and watering areas. The hope is to fill the tag early on the first morning of the season. Several years ago, I scouted out an area of quaking aspen surrounded by steep, heavily timbered ridges. The beaver had built numerous small dams in the creeks and flooded several small meadows. The boggy ground had grown up in willow thickets, and sign indicated plenty of elk feeding in the lush meadows. But the area got considerable hunting pressure, and I figured it was going to be a one-shot deal come opening morning. Long before daylight, I was comfortably situated at the base of a spruce overlooking a small clearing at the upper end of the meadows. It was barely light when I chirped and mewed excitedly a few times with a diaphragm call, and within minutes, a cow and calf came out of the brush to within 30 yards of my hiding place. They were still milling around when a 5x5 bull came sneaking out of the woods. The easy shot ended my elk season within 15 minutes of it opening, which was fine by me. Most of the real hunting had taken place in the weeks before; I simply had to wait for the season to open to legally shoot my bull. Most of the instructional videos and CDs on the market today paint a false picture of elk hunting, as they are shot on private land where the elk don’t see much hunting pressure and are far more vulnerable to bugling than the educated elk found on public land. The outdoor TV programs have exposed many more outdoorsmen to the thrill of elk hunting, but they also have given a false impression of how it actually works. Every year it seems there are more hunters filling the woods with grunting, bugling and cow calling—and in the process educating the elk like never before. When I started out, the only elk call I knew was a coiled section of gas pipe that gave out a high-pitched whistle that wouldn’t even do justice to a spike bull, and yet I took numerous trophy elk using this simple call. I stopped using it when I realized I could better imitate a bigger bull with a Herter’s deer call. Next came a mouth diaphragm and PVC grunt tube. 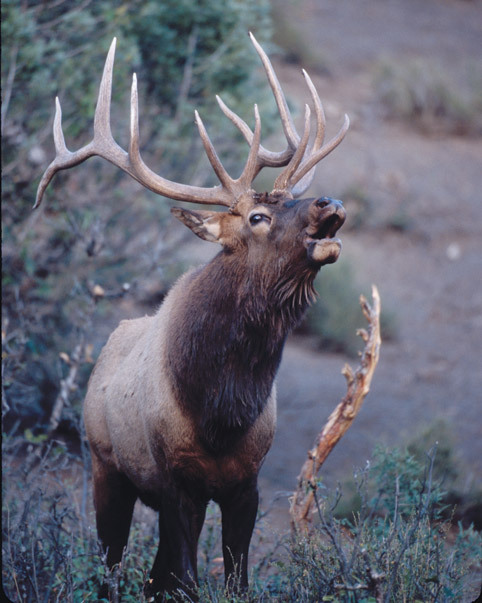 Today, there are hundreds of specialized elk calls on the market, and most make very realistic elk sounds. But again, the problem is a whole lot more hunters roaming the woods blowing on these calls, educating the elk and making them more difficult to sucker with any call. Many of these folks seem to call simply to hear themselves call, reveling in the experience rather than using the call as a tool to actually add to their chances of success. Nowadays, I call less than ever and almost never use a bugle, as I feel imitating a cow or calf gives a much better chance of success. I’ve brought bulls in with only a couple of soft cow sounds that my clients later described as not all that impressive—until the trophy bull walked out of the woods within easy range. The elk is the only one I care to impress with my calling. My good friend Al Morris, who recently won the world elk calling championship, is a professional hunting guide and caller with 20 years experience under his belt. He readily agrees that cow and calf calling is the way to go. But Al takes a slightly different approach, hunting harder and calling more aggressively. He aims to simply outwork the other hunters and overwhelm the elk with calling that sounds totally different from the other hunters’ tooting bugles and lackadaisical cow calling. Al believes the deadliest method of calling bulls today, from the first August bow season through the January late-gun season, is strident and excited cow and calf calling, with as many different sounds as he can master perfectly. Team cow calling is especially effective, and over the past few years, we’ve take several good bulls using this noisy technique. Al readily admits that calling a trophy herd bull away from his cows is an almost impossible undertaking on public land. However, his goal is not to call the bull away from the harem of cows, but rather to swing the whole herd his way. He scouts and hunts silently—until he locates elk. Then he moves to within 150-200 yards and starts calling. He rarely bugles but instead uses fighting cow calls, distressed calf sounds, hyper cow calls as well as mews and chirps to pique the cows’ curiosity and get them headed his way. When the cows come, naturally, the bull comes with them. Al admits that it can be a tough sell. Some of the cows in the herd may be 10-15 years old and may have heard every type of call a hunter can produce. However, even the wise old cows are often fooled by the volume of unique and realistic cow and calf sounds he puts in the air. Like most elk hunters, Al started out listening to other callers. But he says he didn’t really learn the nuances of imitating elk until he spent time in the woods listening to live animals. He’s adamant about sticking with traditional calls and calling techniques, but mastering them to the point of not making any errant sounds. A wise old harem cow with experience avoiding hunter ambushes is a tough adversary. But fool her, and your chances of pulling a bull into range climb immeasurably. Early in the season, Al may use antler rattling, and he has brought in numerous curious cows as well as trailing bulls with this technique. I improvised on this method to help a client tag a reluctant bull a few years back. We were working a bull with cow calls when it became apparent we just weren’t going to get a shot. I finally quit cow calling and started breaking branches off a spruce tree, beating them on a deadfall and raking them through the dead limbs to create as much racket as I could. Up to that point, I had been admonishing my client to be as quiet as possible as we worked our way through the woods and into calling position. I suspect he thought I had lost it, but after less than 10 minutes of this racket, the heavily antlered 5x5 stepped into an opening, and my client put him down for the count. It wasn’t the herd bull we were originally after but probably a satellite bull that just couldn’t stand the thought of missing out on watching a good fight. Both Al and I agree that elk can be called any time of year, as they are very communicative critters. We’ve both called in bulls early in the season before they started bugling, and Al said he actually prefers to hunt bulls then, before they experience fresh hunting pressure. Al also feels that maintaining some semblance of control over human scent, and using the wind to advantage, is often the only way to get a shot at these bulls. He makes liberal use of Hunter’s Specialties scent-control products. Most of my paying clients wanted to hunt during the peak of the rut, when the bulls were supposedly most susceptible. But I, same as Al, believe they are easier to call before then, although they often do not make a sound coming to the call and just seem to appear out of nowhere. Elk are herd animals, constantly communicating. So why wouldn’t they respond to the right sounds before the rut? And same holds true after the rut. Several years ago, on Thanksgiving day during the New Mexico late season, I heard a cow chirping in dense cedars several hundred yards away and immediately started excitedly calling with two different cow sounds. Within five minutes, the elk were within 100 yards, and the old herd bull gave my client a perfect shot. The exultant hunter said he still couldn’t believe elk could be called that late in the season. Of course, you can’t count on that quick of a response. When I set up to call elk, I plan on staying put for at least an hour, and I often sit two or three hours before any elk show up. Most hunters are way too impatient and move while the elk are still working their way in to the calling. But a hunter who is willing to put forth the effort, to hunt smart, be patient and persistent, probably has as good of a chance as ever. Elk may not respond the same as they did 40 years ago, but they roam the same spectacular countryside. I’ve been on a number of elk hunts over the years when no one got a shot, yet I can’t say I’ve ever been on an elk hunt that I didn’t deem a success.